Tracking expenses is always important. During a recession, it is crucial. It’s a Gas: Gas Cubby can track fuel mileage, gas costs, and maintenance, but the app’s real strength lies in its flexibility—you can track as much or as little as you like. 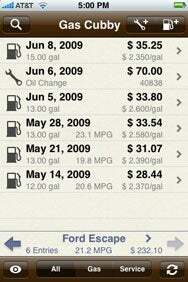 App Cubby’s Gas Cubby for the iPhone tracks gas and car maintenance expenses, charting your miles per gallon, the cost of gas over time, and services expenses. It also reminds you when it’s time to change your oil, your brakes, or perform other maintenance. The app costs $10, though there’s also a free version called Gas Cubby Lite that limits you to five records. The App Store offers many mileage trackers of varying quality. Gas Cubby makes its mark not only with its power, but with its flexibility. Users can take advantage of the full complement of the app’s data tracking capabilities, or they can only enter the information they’re interested in. Don’t think one of Gas Cubby’s fields is all that important? Use the app’s settings to hide the fields you don’t need, keeping the overall interface nice and simple. Gas Cubby’s charts are very useful. They show, over different periods of time, how many miles per gallon the car is getting, how much the price of gas is, and what service costs. Seeing historic miles per gallon information allows the user to see how efficiently they’re driving—quite beneficial when it comes to figure out how well your car is running. Ultimately, Gas Cubby’s real strength lies in the fact that it’s as powerful as you want it to be. The app is a great tool for users who need to track everything about their car, but just as useful if the only data point you care about begins and ends with miles per gallon. AppCubby is compatible with any iPhone or iPod touch running the iPhone 2.x software update.